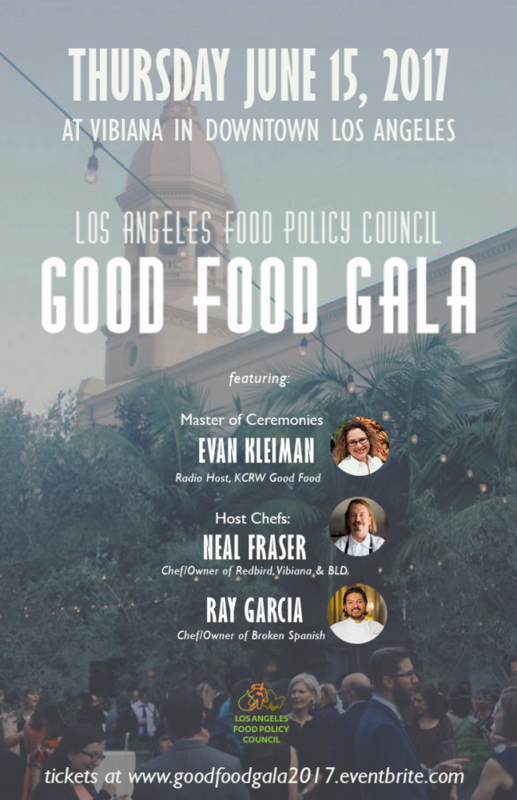 The Los Angeles Food Policy Council invites you to join us for our second biannual fundraiser Good Food Gala on Thursday, June 15, 2017 at the spectacular Vibiana in downtown Los Angeles. Revel in the bounty of Southern California as local farmers and LA’s finest chefs pair up to bring you an unforgettable tasting menu, served alongside craft beverages. Celebrate our collaborative efforts to create a more just and sustainable food system in Southern California. We will also honor and acknowledge exemplary Good Food Heroes!